Camo Urban 275 Paracord is gray, white and black (Polyester/Nylon). Made in USA. 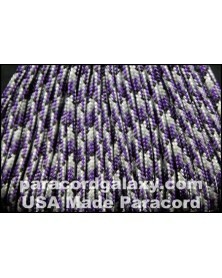 275 Tactical Paracord is the commercial version of Mil Spec 550 Parachute Cord also known as Mil Spec Paracord or Mil Spec 550 Paracord. This polyester 275 cord is smooth and somewhat stiff. The high 250-275 lb. tensile strength gives it superior strength and durability. It resists rot, mold, mildew and UV damage. Assorted solid, Multi and camouflage colors are available. The many uses it has includes making keychains, lanyards, belts, slings, hammocks, shoe laces, gear repairs, survival bracelets and projects only limited by the imagination. Easy to handle and perfect for those times when 550 cord is just too much. I use it to hang chicken feeders, and in my nun-chuck making. Makes an excellent weapons swab for the smaller calibers. This company has excellent service and get the product to you quick.